High hopes and low expectations. The phrase sums up the attitude of companies as they look to Chancellor of the Exchequer Philip Hammond to send a message that Britain remains open for business while heading out of the European Union. With a reputation for being fiscally conservative, Brexit weighing on the economy and the tendency for governments to save big spending for later in their terms, Hammond is not expected to offer a feast of giveaways on tax and infrastructure investment in his annual budget on Wednesday. His limited fiscal room is more likely to be used to boost pay for public-sector workers and provide additional funding for the National Health Service, commitments demanded by anxious Conservative lawmakers in the wake of June’s general election disaster. Bloomberg News spoke to representatives from a range of industries, as well as investors and strategists, to find out what they want from the Autumn Budget -- and how likely they are to get it. Homebuilders Help to Buy, a government-backed mortgage assistance program, is due to run until 2021 and has just received an extra 10 billion pounds ($13. But builders investing in sites now want clarity about its longer-term fate, said Home Builders Federation spokesman Steve Turner. The housing industry also wants to see assistance for small builders to fund projects and proposed planning reforms enacted, issues that Hammond said he will address as part of proposals to build 300,000 homes a year. There is speculation that the chancellor might announce a cut in stamp duty for first-time buyers to help young people get onto the property ladder. Only the first 125,000 pounds of a property purchase is exempt from the levy, but the average U.
house price is now more than 225,000 pounds. In London, where the average is almost 500,000 pounds, stamp duty accounted for more than a third of median full-time earnings last year compared with just 7 percent a decade earlier, according to researchers at the London School of Economics. Prospects: “The prime minister has nailed her colors to the mast” by making housing a priority for her government, said Turner. Theresa May promised the government would go further “in the coming weeks and months” to ensure more homes are built when she visited a housing development in north London last week, although there are said to be divisions between the prime minister and the chancellor over the issue. Hammond told BBC TV on Sunday the government won’t “pour money in” but pledged to use the “powers of state” to get houses built. Retail The sector wants business rates -- a tax on commercial premises -- frozen in April 2018 and the government to bring forward plans to link annual increases to consumer prices rather than retail prices. The levy, which helps fund local services, is due to rise by almost 4 percent in April. It would increase by only 3 percent if it was indexed to the CPI, something the government plans to do in 2020. The British Retail Consortium says relief is needed to help firms struggling to cope with a range of other government-imposed costs as well as higher import prices. The BRC also called on Hammond to keep down the cost of living by holding income-tax rates and accelerating planned increases in the amount people can earn before paying tax. Prospects: Both the retail and banking sectors have called on the government to revisit business rates after a revaluation in April -- the first in seven years -- left many firms facing higher bills. As the tax is based on annual market rent, cost increases have been particularly acute in London, where property values have risen sharply in the past decade. Tax The Confederation of British Industry is calling on the government to “send signals that the U.
is open for business” by committing to phasing out the corporation-tax surcharge on banking profits and exempting new plant and machinery investments from business-tax calculations. The chancellor is also under pressure to tackle tax avoidance in the budget. 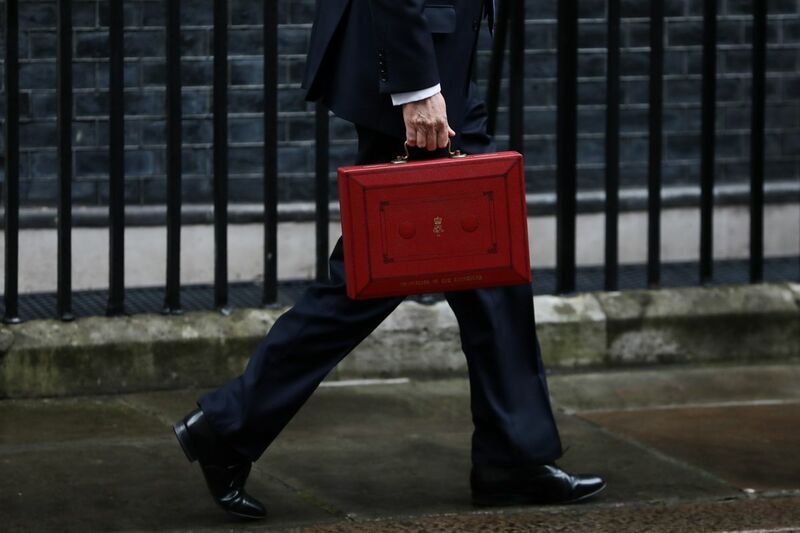 Prospects: “There hasn’t been a political vision set out on tax and spend by this chancellor and this government,” Emily Andrews, a researcher at the Institute for Government, said in an interview. “We’re not expecting anything big from this budget. ” Auto Demand for new cars is being dented by weakening consumer confidence and confusion over the future of diesel vehicles. The Society of Motor Manufacturers and Traders wants the government to reassure consumers that the latest low-emission diesel cars won’t face bans, charges or other restrictions after the government announced an end to the sale of fossil-fueled vehicles from 2040. Prospects: Rather than reassurance, owners of diesel cars could be hit with higher taxes following the budget, a recent newspaper report suggested. Hammond will also announce government support for the development of driverless cars, he said on Sunday, with a goal of seeing them on the roads “without the safety attendant” by 2021. Other demands by industry: Currency and Fixed-Income Markets With the pound weighed down by uncertainty over Brexit, it would take a big fiscal expansion to boost the currency, says Neil Jones, head of hedge fund sales at Mizuho Bank Ltd.
“We need something a bit special for the pound to rally, something that puts money in people’s pockets,” said Jones. “If there are no expansionary measures to speak of, the pound will likely sell off again. ” On the other hand, investors in gilts want the status quo to be maintained to avoid pushing prices down by flooding the market with extra debt, according to Paul Rayner, head of government bonds at Royal London Asset Management. Prospects: Jones says he is “not optimistic of any fiscal fanfare” as Hammond is expected to continue with his budget-cutting strategy. Rayner agrees, saying there would have to be a “complete sea change in the Conservatives’ and the Chancellor’s thinking in terms of austerity,” meaning he is not worried about gilt yields rising. — With assistance by Thomas Penny.